Video 16:9 NTSC, region free. 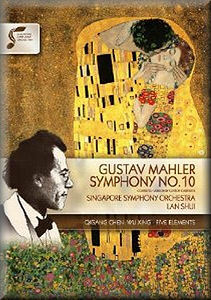 Announced as a commemoration of the 150th anniversary of Mahler’s birth, this recording by the Singapore Symphony Orchestra is also apparently the first video/Blu-ray release of his Symphony No. 10 as completed by Clinton Carpenter. This version is less frequently heard than the ‘performing version’ by Deryck Cooke, but as discussed in Tony Duggan’s excellent comparative review of recordings of Mahler’s Symphony No.10, Carpenter was the first to begin working on this project, commencing as he did in 1946. The first edition was completed in 1966, ten years before Cooke’s was published in 1976. As well as these two, there are also versions by Joe Wheeler, and more recently Remo Mazzetti, Rudolf Barshai (1924-2010), Nicola Samale and Giuseppe Mazzuca. Beginning with the Adagio, the only movement completed by Mahler and which has often appeared as a single movement on Mahler symphonic cycles, we get the measure of the Singapore Symphony Orchestra and Lan Shui’s conducting. Directing without a score, Shui doesn’t linger or cloy with over-sentimental fussiness. This is perhaps not quite the most gripping of Adagio recordings, but it works well enough – clean and efficient, rather than streaked with the blood and sweat of intense and daring risk-taking. The real passionate work comes later on. The recording is detailed and bright, and although the absolute sheen of the strings may not be quite as glossy as Sir Simon Rattle in his later Berlin Philharmonic recording this is clearly a crack band, standing up well to the edge-of-the-seat scrutiny of microphones and assorted cameras. The impact of ‘that chord’ at 19:15 will make you jump out of your seat, cleverly preceded by some disarmingly innocent celestial ceiling-gazing by the video director. Musically things become interesting with the second movement Scherzo. Carpenter clearly had a different idea to Cooke about what Mahler might have done had he lived to revise his scoring, and there are quite a few extra trills, counter-melodies, darting changes of tempo and other twiddly bits added to what was actually quite a substantially notated original. The overall effect is for this reason not hugely different to the Cooke version, and the extras either add character or pickiness, depending on your mood or point of view. Having become so used to the Cooke version it’s hard to know whether the opposite would be the case were the tables turned, but to my ears the music is eccentric enough without too much extra superimposed material. The rather Hollywood tinsel of the final section, marked ‘Pesante’ with Cooke is a case in point. This does stand very well as a performance in its own right however, and with absolute conviction from the performers as good a case as any is made for Carpenter’s version of this movement. There is some structural adjustment going on in the ‘Purgatorio’, unnamed as a movement in this version. However, in essence the extra thematic flights and different approach to texture don’t create as much of a ‘new’ movement when compared to Cooke as you might think. It is with the fourth movement Scherzo that the sense of an alternative vision becomes most immediately apparent. Cooke’s version is rich and effective, but for me always leaves the sense of an unfinished work – the realisation that Mahler would certainly have done more had he lived to create a definitive and complete piece. Carpenter’s working of the material doesn’t sweep away all of the musical idiosyncrasies left by the bare bones of Mahler’s short score, but at least gives a more immediate impression of something established and rooted in its own tradition. There are some magical moments, and the Singapore players if anything warm to their task in this movement even more than in the rest of the piece. There are too many differences between Carpenter and Cooke to mention, and I have to admit to getting lost while trying to follow Carpenter using the Cooke score, but the overall effect is more important than the technical analysis in my view. I found myself sold on this version the more I listened. The fifth movement Finale opens with that now famous damped bass drum, and sounds suitably funereal. Carpenter uses the keener edge of trumpets to top the brass chorale at bar 23, and the flute solo from 30 has a nice harp accompaniment illustrated well in a split view on the video. There is a certain amount of schmaltz in the orchestration which might take a bit of getting used to, but these sorts of things are questions of taste. The orchestral colourings to my ear sometimes have a Tchaikovsky-like flavour: the joviality of the Nutcracker drawn into pits of despond by the mood of the Sixth Symphony amplified by overwrought early 20th century late-romanticism. There is no doubting the effectiveness of Carpenter’s orchestration, but there are moments where Cooke’s closer alliance to what historical Mahler research might consider a more ‘authentic’ realisation allows a clearer window into what Mahler actually left, rather than what someone else feels he might have done. This doesn’t quite tip into over-working of the material, but sails close enough at times. I don’t dislike the result, but am rather glad this plush cast of extras isn’t the only Mahler 10 we have. The programme of this DVD also gives us Wu Xing or ‘The Five Elements’ by Chinese composer Chen Qi-gang. The five short movements each represent a different element: Water, Wood, Fire, Earth and Metal respectively. Clever camerawork helps the ear identify some of the effects which arise, but as with most pieces with such clear themes, the music is not difficult to interpret and follow. There is plenty of interesting percussion with Wood for instance, Britten-like brass chimes and licking flames rising from the double–basses and bass drum in Fire. This is all highly effective stuff, essentially romantic in idiom, but with some gorgeous melting harmonies and sonorities. Bonus features for the DVD include some introductions on both pieces in English from conductor Lan Shui and some photographs including backstage souvenirs, and some of the orchestra’s other concert performances. With good booklet notes by Marc Rochester and clever use of Klimt’s ‘Der Kuss’ to illustrate Mahler’s marital crisis at the time he was working on the symphony, this is a very nicely produced DVD and an excellent recording of Clinton Carpenter’s completion of Mahler’s Symphony No.10. I have to admit to being far more used to hearing the Deryck Cooke version in a variety of recordings, and so accept any comments I may have on the Carpenter version will be compromised by having this as an ingrained reference point. I accept the validity and effectiveness of Carpenter’s version, but ultimately feel closer to Mahler’s intentions in the piece – at the state in which he left it – with Cooke. What this DVD shows is that there is most certainly more than one way to deliver this remarkable piece, and having the choice is most certainly more of an enrichment than a distraction from any one ‘true’ version of the score – something which can never exist in any case.